Albert Einstein lecturing in Vienna in 1921. In the hundred plus years since Einstein published his theory of relativity it has been put to the test many times. General relativity—Einstein’s theory of gravity—has been tested by measuring the apparent shifting of position of stars whose light passes near the sun during a solar eclipse (known as gravitational lensing, discussed here). It has also been used to explain the wobble in Mercury’s orbit around the Sun. 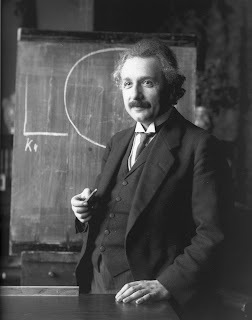 Special relativity, the theory that introduced the concept of spacetime, and from which Einstein derived his famous equation E=mc2, has also been tested—most famously by Michelson and Morley (discussed here) who confirmed that the speed of light is constant as Einstein predicted. Another aspect of special relativity—time dilation—has been confirmed by comparing the time on an atomic clock sent on an around-the-world airplane trip with one left behind. There is a very small difference between the time for the two clocks which agrees precisely with Einstein’s theory. Now it looks like relativity may again be tested, this time by physicists working at CERN who have managed to create and trap small quantities of antimatter by using very powerful magnetic fields in devices known as Penning traps. The antimatter they’ve created is antihydrogen. A normal atom of hydrogen consists of a positively-charged proton bound to a negatively-charged electron. Antihydrogen, however, is made by binding a negatively-charged antiproton to a positively-charged electron or positron. According to Einstein’s theory, if scientists can collect enough antihydrogen to do a spectrum analysis, it should match the spectrum for hydrogen exactly. It’s a long shot that the spectrums will differ, but if they do it would leave many physicists in shock, and quite likely earn the team that discovers it a Nobel Prize. 1) True of false: Einstein’s theory of relativity predicts that gravity can bend light. 2) Antihydrogen is created by binding an antiproton with a(n) _________________. 3) True or false: a clock in motion runs slower than a clock at rest. 4) Antimatter has been contained in small quantities using a _________________. 5) In E=mc2, the constant c stands for _________________.